Note: This 3-part blog post series is now complete! After an exhaustive run-through of all of the various Photoshop blending modes, you probably noticed that many of them don’t have immediate practical applications. I haven’t been able to find any word from Adobe on what the actual uses of some of the more obscure options could be, but perhaps they’ve simply been in the program so long it’s not worth removing them. Either way, there are a few blending modes that are extremely helpful, so we’re going to take a closer look at a selection of the best ones and go into how you can use them in your work. Arguably the most useful blending modes are Overlay, Screen, Multiply, Colour and Luminosity, though not necessarily in that order. Let’s dive in! Overlay is one of the blending modes that combines the functions of two others, Screen and Multiply. Screen can be used to lighten images or decrease contrast, and Multiply tends to darken images and increase contrast, depending on the colour and luminosity of your blend pixels. If your blend pixels are dark, Overlay functions like the Multiply blend mode, and if your blend pixels are light, it functions like the Screen blend mode. Your results are a combination of your base pixels and your blend pixels, making it easy to incorporate new image elements into an existing scene if you’re working on a composite as the lighting on the new pixels will seem to blend a bit more smoothly into the original image. Alternatively, you can use Overlay as a non-destructive means of dodging and burning your photography by simply painting on a new layer using various shades of grey. Lighter pixels will brighten areas, and darker pixels will darken areas. As you can see in the image below, a few simple brush strokes of white and black (at reduced brush opacity) on the leaf can darken the leaf itself and brighten the water droplets, dramatically increasing the contrast non-destructively without affecting the rest of the image. If you’d prefer to maintain a bit more control over each aspect of your burning and dodging, you can use the same general principles as the Overlay mode except create two separate layers, one using Screen and one using Multiply. Work on your highlights with white on the Screen layer, and work on your shadows in black on the Multiply layer. If you’ve ever seen a recoloured photograph from the days where black and white was the only option available to photographers, you’ve probably seen the Color blending mode in action. As we explained in the earlier posts, the Color blend mode combines the luminance value of the base pixel with the hue and saturation of the blend pixels. In plain English, the brightness stays the same and only the colour itself is changed. The effect is similar to using a colour filter on your camera or looking at the world through coloured sunglasses, except that you don’t lose any of the brightness of the image since Photoshop preserves luminosity. This blend mode is probably the fastest way to colourise a black and white image, or to tint an image into a single tone. As you can see in the image below, the Color blend mode makes an image appear to be a simple duotone image without all that pesky messing around with Image Modes in Photoshop (which can severely limit your other editing options). All that’s been done to this image is to fill the left half of a new layer with cyan, and then switch the blend mode to Color. This blending mode is technically the opposite of the Color blend mode, as it maintains the hue and saturation of the base pixels and combines it with the luminance of the blend pixels. 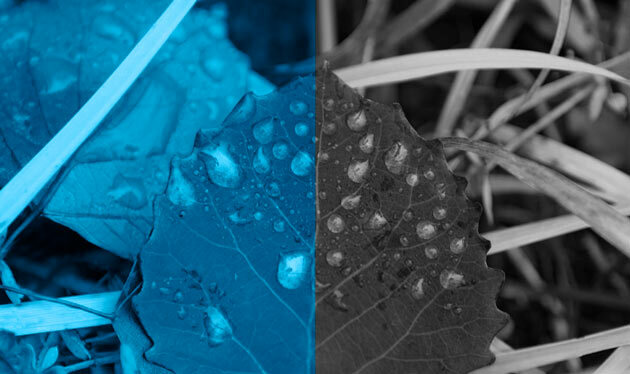 For example, moving the cyan layer from the previous example below the leaf photograph and changing the leaf layer’s blend mode to Luminosity, we’d create the exact same result. That’s not particularly useful, though, as it is a bit counterintuitive to the way most people think about how Photoshop layers work. It has some other interesting uses that may not be immediately apparent when experimenting with layers, but are still quite helpful. If you’ve been working with Curves and layer masks as your primary means of contrast adjustment, you’re probably quite familiar with how powerful the tool is. Unfortunately, it can have some unintended consequences with regards to colour if you’re not careful. Most of the time when you increase contrast with curves, you’ll see a slight increase in the saturation of colours at the same time, and this is usually a good thing that looks fairly natural. Sometimes it can seem a bit garish though (or it’s just not the effect you want to create), so the Luminosity blending mode can be a real help here. Blending modes can be applied to adjustment layers just like they would to any other layer, and that will prevent your Curves adjustment from affecting colour saturation. It’s not always much of a noticeable difference, but it tends to become more apparent when your image is primarily composed of reds and blues. In the image below, both upper and lower halves of the image have the same Curves adjustment applied, but the bottom section has the Luminosity blend mode applied. The sand is more or less the same colour in both sections, but the red and bluish stones change quite a bit. As in all things Photoshop, there are usually at least 6 different ways to accomplish the same ends – so if these methods ‘click’ for you, go with them! Some people will prefer to use other techniques to achieve the same results, but your workflow is just that – yours. Choose the method that appeals to you the most, and refine it until you become a master. Just remember that you may discover a new method that works even better, so always be on the lookout for new techniques!